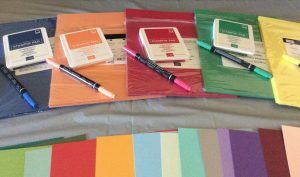 For a limited time when you sign up for the Paper Pumpkin Kit, you get a FREE set of Stampin’ Write Markers. Click Here to learn more about Paper Pumpkin. And hurry the offer ends February 10th, 2014. Interested in learning how to make these cards? and I will be glad to show you how. This is a picture of our August Project. A nice little Thank You Card. You really can make some great cards.